Kali Puja Celebrations are dedicated to Goddess Kali. She is the first incarnation of Maa Durga. Kali Puja is done on the main day of Diwali and coincides with Lakshmi Puja. Devotees at West Bengal, Assam and Orissa worship Goddess Kali with intense fervor on Amavasya Tithi or new moon night while those in other parts of India worship Goddess Lakshmi on this day. Bengal Kali Puja is one of the biggest religious festival which is eagerly awaited by the Hindus of West Bengal. 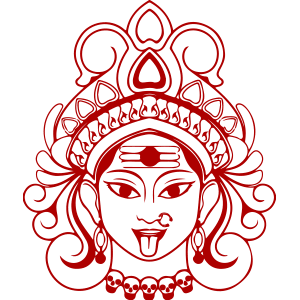 Maa Kali is the most aggressive form of Goddess Durga. She is worshipped as the destroyer of evil and the one who fights against all the injustice that prevails in the world. Goddess Kali is also known as Shyama, this is why this puja is also known as Shyama Puja. Devotees worship Goddess Kali in their homes or even in open pandals. On the day of Kali Chaudas, she is usually worshipped during the night with mantra recitals. People offer her flowers, fish, meat, rice and sweets. At a few places, animal sacrifice is also performed in honor of Maa Kali. Through this Puja, her devotees seek her blessings as well as her protection from all the evils in life. The celebrations on this day are marked by beautiful decorations, fireworks, sweet preparations and magic show, among others. People meet each other and visit the Pandals throughout the night to seek Maa Kali's blessings. People in these regions celebrate it with enthusiasm, fun and passion. Worship of Goddess Lakshmi in Bengal is done in the Hindu month of Ashvin. It is performed on the full moon day or Poornima of this month in West Bengal and is known as Bengal Lakshmi Puja or Kojagara Puja.